Paul sent in this still taken from the film 'Hell Drivers', which came out in 1957 (Rank Organisation). 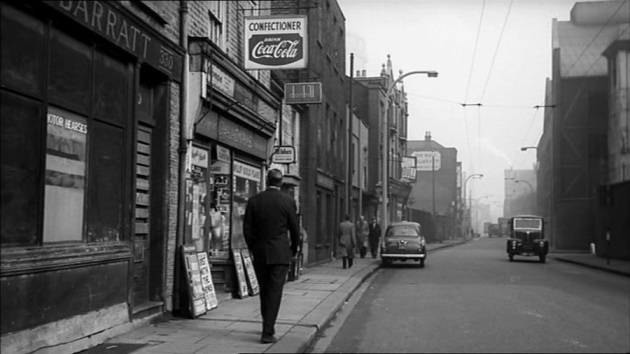 The still shows when Stanley Baker walks past 330, Barratts the undertakers, and goes into George Adnam's newsagents ( name just about readable ) at 331, to see his brother. On right is the Brentford Gaslight and Coke Co. large buildings. Camera viewpoint here is looking east back towards Kew Bridge direction. I looked on Ancestry to see what happened to Mr Adnams and his last phone book entry is for 1956 at 331 High St, but also there's a George A Adnams 125 Norwood Rd, Southall, confectioner and presume that must be him too. After this, he disappears. Barratts appear in 1965 at 468 Chiswick High Rd, W4. I think 1957---when the film was filmed---must be getting close to when these buildings along here came down. More about this area of the High Street and links to earlier photos.